Bootlegger Trail is a short, steep side trail off the Crest Trail #270 in the vicinity of Rustler Park. It connects the Crest with two primitive forest trails, Rattlesnake Trail #275 and Rock Creek Trail #259, both of which lead down the mountain to the west. The Bootlegger Trail connects with the Crest at two points. One is just above Rustler Park Campground about 0.4 mile south of where the access trail from the campground intersects the Crest. The other junction is at Bootlegger Saddle, about one trail mile farther south on the Crest. In between those two points, the Bootlegger Trail drops down onto a saddle that separates the upper reaches of Rattlesnake and Rock canyons. Trail surroundings here are forests of pine and fir. The saddle and a few points along the trail offer views of both of the aforementioned drainages as well as the lower western slopes and peaks of the Chiricahuas. The southern section of the trail, between the Rattlesnake/Rock Creek junction and Bootlegger Saddle is very steep, ascending 500 feet in less than half a mile. The northern section of the trail has some stretches that will make you breathe hard as well. 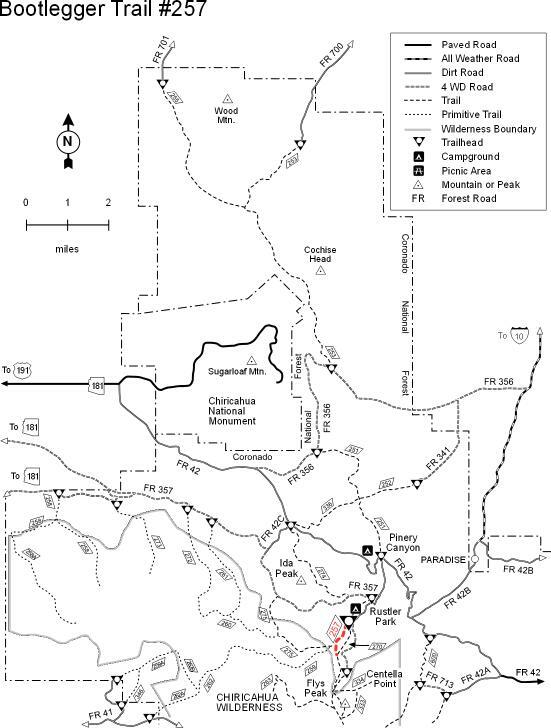 In addition to providing access to the Rattlesnake and Rock Creek Trails, Bootlegger Trail offers an opportunity for a loop out of Rustler Park Campground. This loop incorporates about a mile and a half of the Crest Trail from the campground. Best views are at Bootlegger Saddle where you can see a number of mountain ranges and valleys to the west and south of the Chiricahuas.